49 PVCC DIGITAL FALL 2014 Workforce Services Class Schedule workforce@pvcc.edu l www.pvcc.edu/workforceservices or 434.961.5354 Tasting Room Management Certificate Core Courses Introduction to Tasting Room Management Learn ways to make your tasting room more memorable and profitable. We'll discuss tasting room staffing and training, events management and tips, wine tasting strategies, tours, social media and other ideas to help increase business. 46272 AGNR M 8/18 9 a.m.-1 p.m. RM 131 Mitchell $59 Superior Customer Service Join Frank Squillace, master of outstanding customer service, in this dynamic course. Learn to listen and understand your customers (and your friends and family). This course is a "must" for anyone who works with customers. Spring 2015 Wine Analysis & Tasting Do you know how "farming the grapes" affects their taste and aroma? Can you recognize your personal capabilities in wine tasting? Become a competent wine taster by learning the essentials of professional tasting. Summer 2015 Wine Marketing People in the wine business say that anyone can make wine, but can they sell it? Learn cutting-edge strategies for marketing wine from Neil Williamson of the Trellis Group. Everything from labels to romancing the wine is covered in this required enology class. Enhanced by talks from area wine professionals, you will learn how to design a marketing strategy. Spring 2015 Legal Issues for the Tasting Room Learn the legal issues involved in running a farm winery tasting room from Virginia's wine lawyer, Marybeth Williams. Topics include state compliance for direct shipping. Spring 2015 TIPS® Training TIPS® (Training for Intervention ProcedureS) is the global leader in education and training for the responsible service, sale and consumption of alcohol. Proven effective by third-party studies, TIPS is a skillsbased training program that is designed to preven intoxication, underage drinking and drunk driving. Spring 2015 Tasting Room Management Certificate Program Course Requirements Core Courses: 1. Introduction to Tasting Room Management 2. Superior Customer Service 3. Wine Analysis & Tasting 4. Wine Marketing 5. Legal Issues for the Tasting Room 6. TIPS® Training Elective Courses: 1. Wow, What a Great Event 2. Using Social Media in Business 3. Introduction to Enology 4. Pairing Food with Wine 5. Successful Wine Club Management 6. Sparkling Wine Making A properly functioning tasting room is a key component to a winery's success. 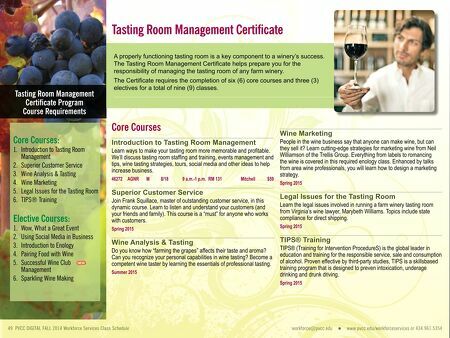 The Tasting Room Management Certificate helps prepare you for the responsibility of managing the tasting room of any farm winery. The Certificate requires the completion of six (6) core courses and three (3) electives for a total of nine (9) classes.